Clearly this information wasn't supposed to get out yet. Too late. We’ve known for some time that Ford was working on a new Mustang GT500. What we didn’t know was what would be resting under its hood. A modified version of the GT350 and GT350R’s 5.2-liter V8? Something different? Something more powerful? Thanks to this scanned image, courtesy of Speed Twitch, from a section of next month’s issues of Motor Trend, that question has now been answered. Although the print is small, it clearly says the following: "A new GT500 with a supercharged 5.0-liter and the new injection setup could debut in 2018." Additional spec information reveals this supercharged V8 will have 680 hp and 630 lb-ft of torque. Speed Twitch further speculates, based on information coming from Ford Performance sources, that a TVS 2.65 blower is being utilized to extract more power from the V8. As of this writing, Ford hasn’t made any official comment, and we’ve reached out to our own contacts at the automaker in order to try to confirm. In the meantime, assuming Motor Trend got its info right, Ford has really come through on this one. 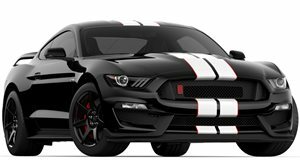 Just to compare, the current GT350 has 526 hp and 429 lb-ft of torque, while the previous generation GT500 generated 662 hp and 631 lb-ft of torque from a supercharged 5.8-liter V8. We’ll updated the moment we learn more.